Why are you struggling to grow your business when everyone else seems to be crushing their goals? From Impossible to Inevitable provides a template that the world’s fastest growing companies follow to achieve and sustain much, much faster growth. This template includes the seven ingredients of hyper-growth. Authors Aaron Ross and Jason Lemkin take each ingredient and break it down into specific steps to guide you through implementation. 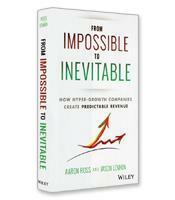 From Impossible to Inevitable helps you take impossible goals and turn them into inevitable successes for your business and team. To understand and apply the seven ingredients of hyper-growth. How to specialize your sales process and scale your sales team. What it really means to “do the time” in today’s business environment. The difference between functional ownership and delegation. How to define your destiny in a new or existing business.